“There will be an simulated emergency communications drill on November 8th between 9 AM and 1 PM that is being staged by the SE Mass ARES/Skywarn leadership. [The Bristol County Repeater Association] will be participating and will be providing input to the National Weather Service in Taunton. The club emergency communications group and anyone else who is interested in participating is welcome to do so. We will be utilizing the 440 machine primarily for the exercise as a test of the effective communications coverage in the city (especially the waterfront and low lying areas) and will use the 2 meter machine if needed for backup and for any participant who doesn’t have 70 cm capability. Further details of the exercise will be posted on the reflector in the coming week, as well as the area frequencies that will be used. 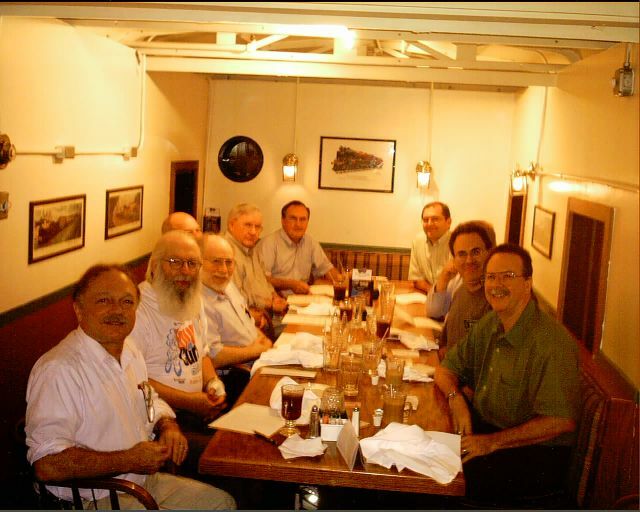 The Patriot DX Association has decided to rename itself the New England DX Century Club, according to the club’s PR officer, Jim Tumelty, W1CWU. NEDXCC offers the latest DX videos, DXCC card checking, as well as information on sunspots and propagation. The NEDXCC is sponsoring a “DX Challenge” from Oct. 20-26 and Nov. 24-28, 2003. It meets at 221 Cabot Street, Beverly at 7 p.m. The next two meeting dates are November 24 and December 22. For more information, visit http://www.nedxcc.org. On behalf of all the Eastern Massachusetts (EMa) DEC’s and EC’s, I would like to extend a cordial invitation to play in our annual Section Emergency Test (SET), scheduled for Saturday November 8th. As most of you know, it is our annual opportunity to formally evaluate our emergency commmunication skills, and readiness to respond to exingencies. This year we will be emphasizing local response with a mandatory interdistrict communication element. Please contact your DEC to coordinate your efforts on this year’s exercise. The ARES Leadership is reminded to keep a detailed roster and/or logs of those stations participating in the SET. Press this link CCARESsetOutline&Scenario.pdf to view specific planning material that your ARES leadership will use. Press this link Middlesex District ARES SET.pdf to view specific planning material that your ARES leadership will use. Press this link South Shore/Bristol Plan.pdf to view specific planning material that your ARES leadership will use. Press this link Metro Boston Plan.pdf to view specific planning material that your ARES leadership will use. My plans for the Nov 8th SET are as follows. 1.) Send Bill Foley & the Army a formal written invitation to participate in the Nov 8th SET. 2.) I will be hosting a meeting at the Chelsea EOC on the Oct 21st. for all Metro-Boston ARES Members to discuss and plan our participation in Nov. A notice is going out in the SPARK on Thur. about the meeting. I would like the group to plan collectively for the SET. Press this link ARESsetOutline&Scenario.pdf to view generic planning material that your ARES leadership will use. Please note that frequencies will probably be developed for this exercise using standing (existing) district frequency plans. Please consult with your EC/DEC for details. *Rob says BBS is good at NWS. CT people need to set one up? *The exercise scenario is regionwide impairment caused by release of massive cloud from Schlotzsky brewery in eastern PA. Theme of exercise is regionwide coordination of ARES response. *The exercise starts at 1700 Friday 17 Oct, and ends approximately 1300 Saturday 18 Oct.
*Exercise docs in Schlotzsky Yahoo! site. *Many of the emails there as well. *We play mostly reactively. We can do some local improvisation if we want to. *Use 53.31 to coordinate, and IRLP freqs Rob will announce. Negotiate use of any other appropriate repeater freqs. *No RACES leadership stations will be up in EMa for this exercise. Born June 28, 1926 in Jamaica Plain. Graduated from St. Ann’s School Neponset June 1939. Graduated from Mechanic Arts High School (now Boston Tech) June 1943. Served US Army Air Corps as a bandsman and also a broadcaster on the base Armed Forces Radio Station at Fort Pepperell Newfoundland, August 1945 to December 1946. Played the trombone in the Army and also locally with American Legion Bands, but I was a lousy trombone player. Upon return to civilian life I worked for phone company 1947 – 1949. Joined the City of Boston Public Works Dept. in 1950 and later the Boston Water and Sewer Dept. until retirement in 1996. The last 15 years of which I served as their Radio Dispatcher and was responsible for keeping their repeaters in operating condition, working with FCC licensed contractors. 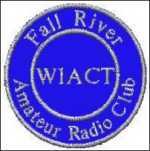 Joined the ranks of amateur radio June 10, 1959 as a tech and operated six meter AM. Upgraded to General Glass and Advance class a few years later. At that time Hams took their exams in the FCC Office at the Custom House Building in downtown Boston. Joined EM2MN back in the days when it was on 145.800 using AM emission before we had FM and repeaters. Had to use Beam Antennas to communicate and pass traffic. That was back in 1978. Have been NCS on EM2MN on Friday nights for 25 years. “For those folks interested in participating in the Simulated Emergency Test (SET) on Nov. 8, or in becoming more active in the Amateur Radio Emergency Service, please plan to meet with me at 7 p.m. Oct. 28 at the club shack. The meeting is, more or less, a get-acquainted meeting with some discussion of plans for the SET and follow-on activities, as well as, possible organizational planning. For additional information about Radio Operators for Missing Children, contact kb1hgk@lyceumpress.com or visit http://www.lyceumpress.com/ham_radio.htm. U.S.S. Constitution Turnaround: All Hams On Deck! The weather was beautiful and Amateur Radio was very much in evidence at this weekend’s USS Constitution bi-annual “Turnaround” event at the Old Boston Navy Yard in Charlestown, October 11. 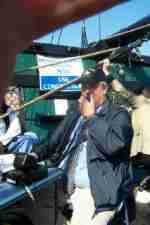 The Amateur Radio activities, spearheaded by Bob Callahan, W1QWT, featured two special event stations, Amateur Radio stations aboard the three ships, as well as an operator situated at Castle Island. The USS Salem museum ship in Quincy was also active during the event. On the Old Boston Navy Yard pier, station N1B was set up in the visitor’s kiosk in front of the USS Cassin Young. HF and VHF stations were operated on 17, 20 and 2 meters. N1B also acted as a net control station on .52 simplex, fielding “sitrep” (situation reports) from N1S, WW2DD and KS4E aboard the USS Constitution, USS Cassin Young, and USS Chaffee, respectively. Ironically, the Chaffee is the newest addition to the Navy’s fleet; the USS Constitution is, of course, the Navy’s oldest commissioned warship. (Photo: W1QWT operating N1S)The Constitution Turnaround garned good advance publicity in Amateur circles thanks to an article that appeared earlier on the ARRL Hq. web site. Some valuable publicity was obtained during the voyage when the Commander of the USS Constitution announced to everyone on board that Amateur Radio stations were operating from each of the ships and from the Navy Yard, making contact with other amateurs around the world. The former Commander of the USS Constitution visited N1B, chatting at length with amateurs about his days as a radioman. Bob Callahan, W1QWT reports that the Constitution special events station N1S garnered over 300 contacts in 20 countries. Callahan was joined aboard the USS Constitution by K1RV and NS1N; K1RMC, KC1HO, W1USN and AA1M operated aboard the USS Cassin Young. At the Navy Yard, W1YR, N1BSO, KB1GIS and K9HI operated N1B. They also staffed a public display table with ham radio promotional materials. A Boston-area amateur is involved with a grass-roots effort to promote ham radio and electronics among Dorchester youths. The group plans to hold a steering meeting on Tuesday, October 14, 2003, at 7:00 p.m. in the Community Services Room at the Dorchester Area B-3 Police Station. Morris has requested representation from the Boston Amateur Radio Club to “provide insight and guidance” to their effort. BARC’s Vice President, Blake T. Haskell, K1BTH, has indicated that he will attend. Metro Boston District Emergency Coordinator Mark Duff, KB1EKN is hosting a planning meeting for all amateurs who are interested in participating in the upcoming ARRL Simulated Emergency Test on November 8, 2003. “Collectively, we will plan our participation in this most important training exercise,” Duff stated. The meeting will take place on October 21 at 7:00 p.m. at the Chelsea (MA) Emergency Operations Center at 500 Broadway in Chelsea. There is ample parking at Chelsea City Hall.